Mention comfort food and people generally think of homemade chicken soup or meatloaf and mashed potatoes. These staples of the American table deserve their due, but for Janine and me, the most comforting of all foods is pasta. Not the heavy, unrefined “Red Lead” over spaghetti that is often served for Sunday dinner, but a serving of appropriately shaped pasta, lightly coated with a sauce that highlights a few main ingredients and not much else. 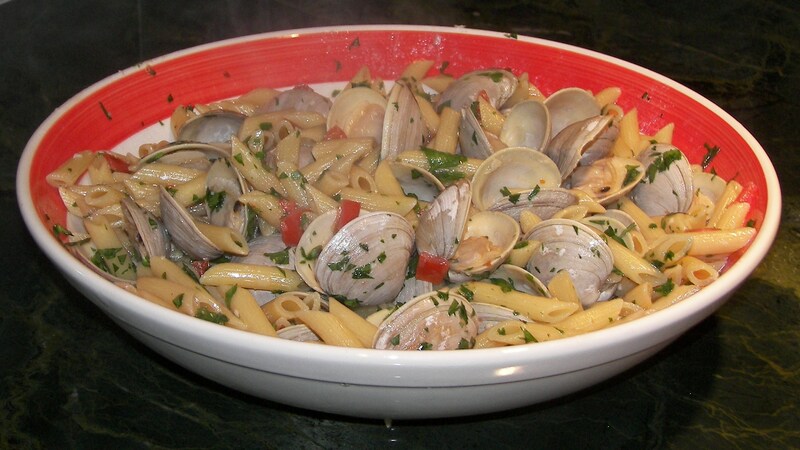 Our version of Penne and White Clam sauce is a good example. The bi-valve’s briny qualities are the focal point of the dish. Their flavors are coaxed by gently steaming in olive oil, garlic and white wine. 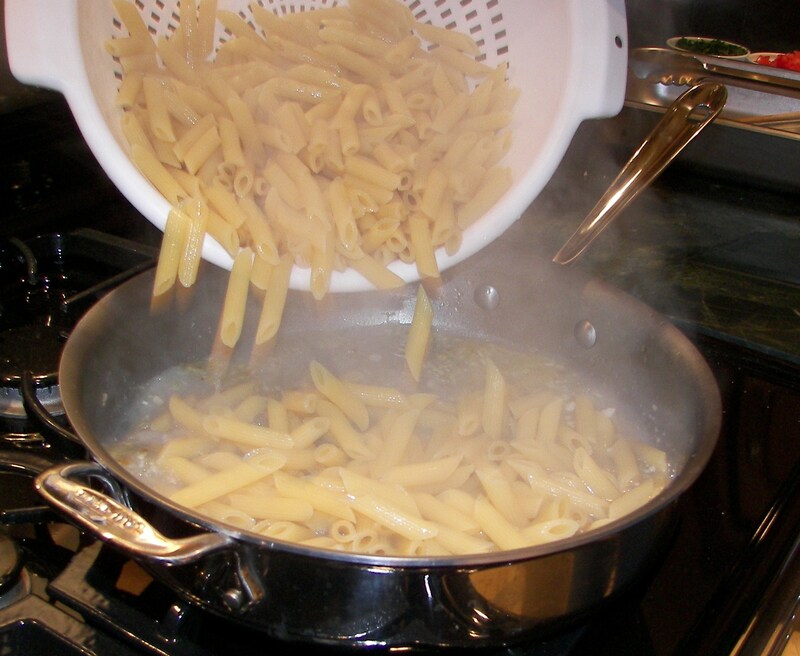 The pasta is partially cooked in boiling salted water and then finished in the residual steaming liquid. This infuses it with clam flavor. Chopped tomato and parsley are added for a little color. A richness is achieved by folding in a few pats of butter right before serving. Carbohydrates be damned! This to us is heaven in a bowl! The shells of the clams must be cleaned thoroughly since they will be folded into the final dish after they are steamed open. I favor using a 3M green scouring pad. 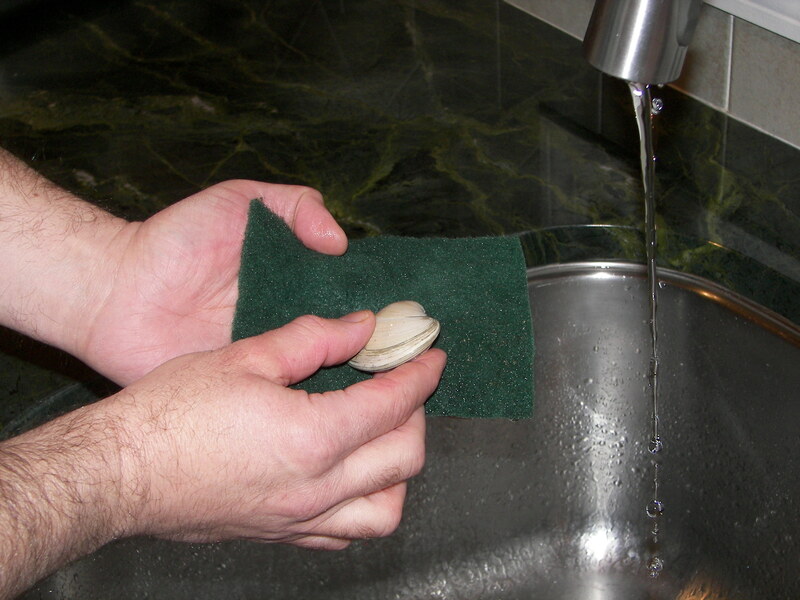 Simply scrub each clam under running water until all traces of sand and debris are removed. Rinse clams thoroughly and set aside. Place a large pot of water over a medium flame. Cover and bring water to a slow simmer (The water will be brought to a boil and the pasta added once the clams are steamed open). 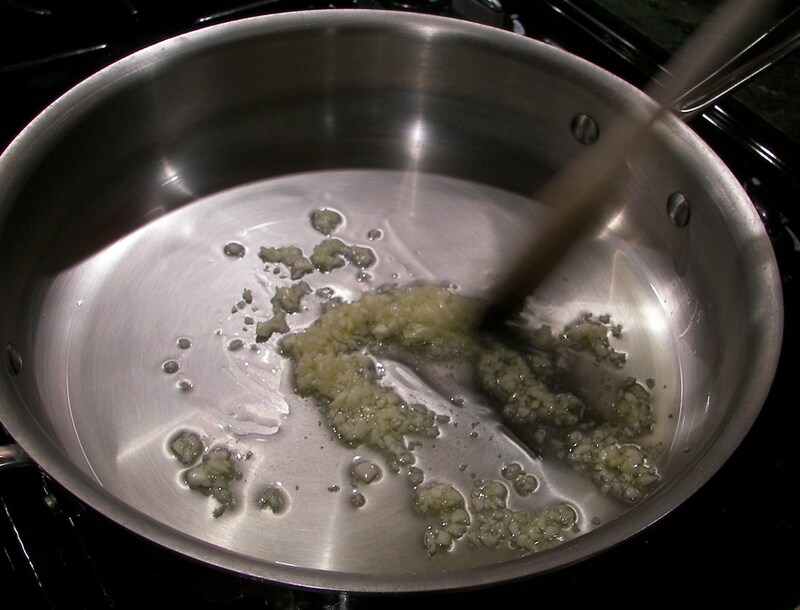 Pour olive oil into a sauté pan with a tight fitting lid. Make sure the pan is large enough to hold an entire pound of cooked pasta. Add minced garlic. Set the uncovered pan over a medium low flame. Stir to distribute garlic evenly in oil. Add crushed red pepper and continue stirring until garlic becomes lightly golden. Add the clams to the pan. 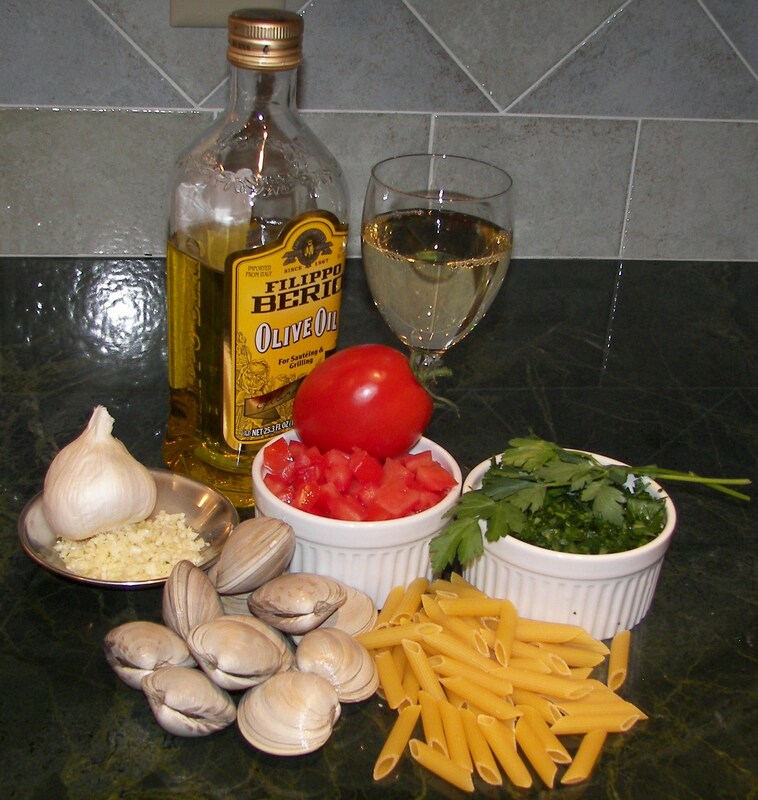 Shake briskly to coat the shells of each clam evenly with oil. Raise flame to medium high. Continue shaking pan for another minute or two. Add the wine and bring to a boil. Lower flame to medium and cover pan to steam clams. Periodically shake pan lightly to agitate clams in the simmering liquid. Peek under the lid to check progress. 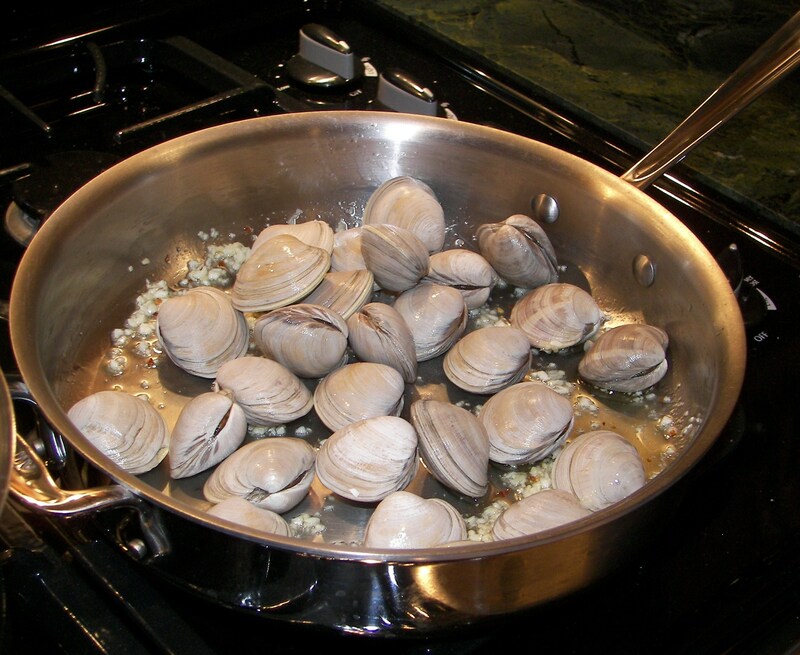 Remove clams from pan as soon as they open. Be careful not to overcook them or else they will become tough and rubbery. 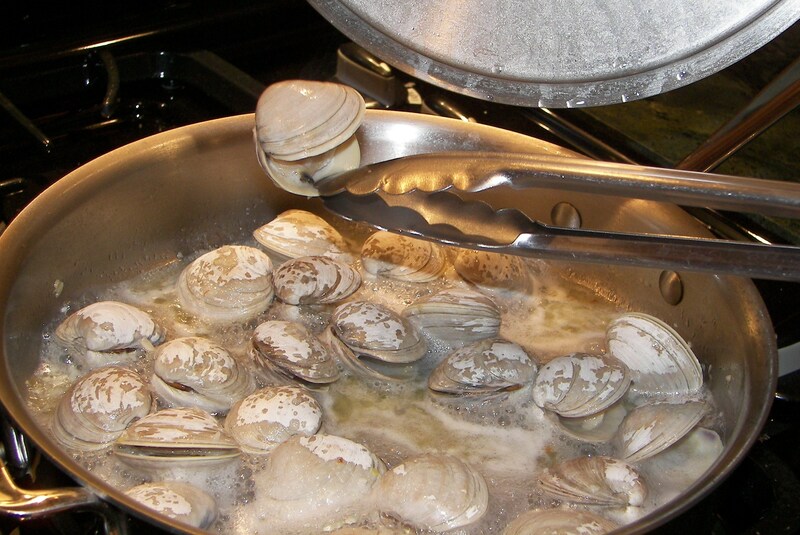 Place open clams in a bowl covered with aluminum foil. Keep warm until you are ready to incorporate them into the cooked pasta. Keep peeking under the pan and removing clams until they have all opened. Raise flame under pot of water to high. Bring to a rolling boil. Add salt, then pasta. Stir to ensure the paste does not stick together. Note: It is very important that the pasta is not cooked all the way through in boiling salted water. It will be added to the sauté pan and finish cooking in the clam broth. When the pasta is about ¾ of the way done, strain it from the pot of water and add it to the pan of clam broth/wine mixture. This in an important step because the time the pasta spends in the clam broth will permeate it with flavor. Dry pasta usually takes about 10 minutes to cook. For this dish, the pasta will cook in the salted water for about 6-7 minutes. Pull a piece out of the water periodically and taste it. The pasta should be a bit firm inside nut not crunchy. Adjust the sauce while the pasta is cooking. Clams are unpredictable. You never know how much liquid they will give off until you actually cook them. There should be about a cup and a half of wine/clam broth left in the sauté pan after the clams have been removed. This much liquid will be needed to finish cooking the pasta. If more liquid remains, raise the flame to high and bring to a boil. Reduce the liquid over high heat until the appropriate amount remains. If not enough liquid remains after the clams have been removed, add a little more than necessary from the bottled clam juice and reduce slightly to concentrate the flavors. After the pasta has cooked for about 6-7 minutes, strain out as much water as possible and add to the sauté pan containing the clam broth/wine mixture. Add chopped tomatoes and stir to combine. 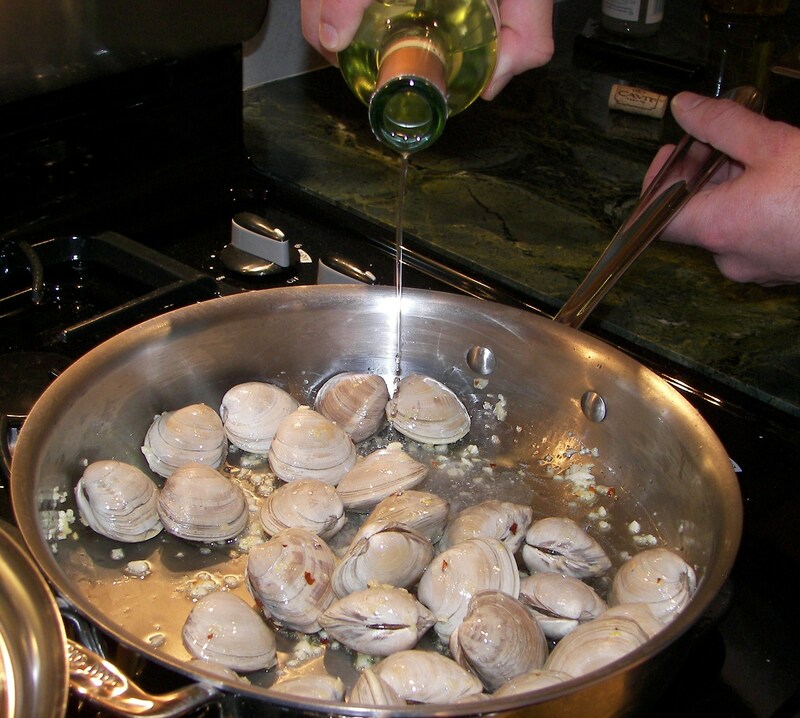 Pour any liquid remaining in the bowl of clams into the pan (Do not add clams yet). Set flame to medium and cover pan to finish cooking pasta. At this point, it should only take a couple of minutes to finish cooking the pasta. Stir every minute or so and taste a piece of pasta to check if it is done. Note: If too much liquid evaporates and pasta starts to stick to the bottom of the pan, add more of the bottled clam juice. 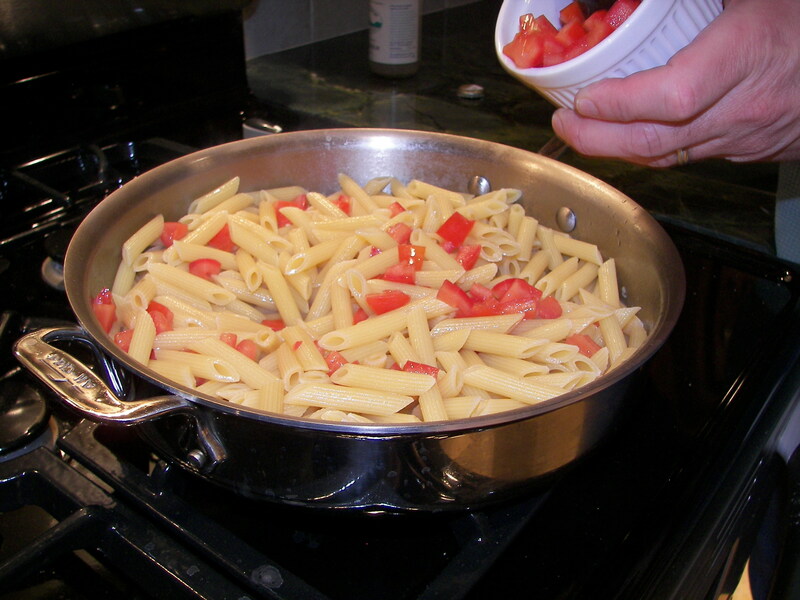 There should be about one cup of liquid left in the bottom of the pan when the pasta is fully cooked. When the pasta is al dente, lower flame to lowest setting and add 3 tbsps of butter. Stir until butter is melted and combined into the sauce. Pour pasta and the remaining butter/clam sauce into a large serving bowl. Fold in the clams and chopped parsley. Any ingredients shot with wine in it gets my vote! Thanks Happiness Stan! We appreciate you visiting our site.